Destroy the waves of aliens that come from the sides of the screen. When you finish a level you will rocket to a new level. There are several different waves to go through in this game. 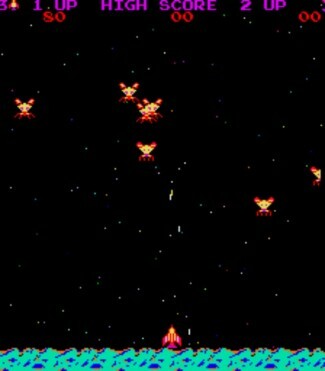 The first wave is similar to Galaxian, with aliens diving and shooting at you. Another wave rips off the Pleaides wave of the birds that will dive straight down if you shoot one or both of their wings. Another wave consists of navigating your ship through an asteroid field to dock with a module before your fuel runs out, and a creepy-looking boss marks the final wave, as you must destroy it’s sentry ships before going after the boss itself. Then all of the waves will repeat.